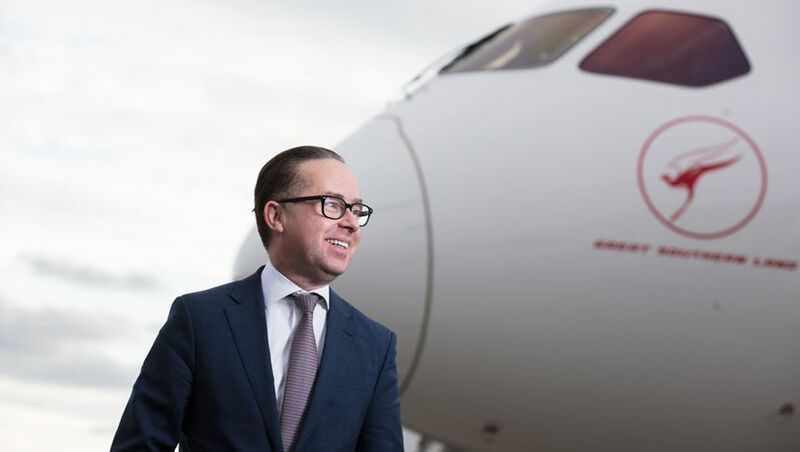 Qantas CEO Alan Joyce remains upbeat about the prospects of Boeing's forthcoming mid-sized jet, informally dubbed the Boeing 797 and expected to take wing in 2026. Joyce sees the Boeing 797 as an ideal candidate for transcontinental flights as well as some nearby Asian routes, making it a potential replacement for the Airbus A330s. Speaking at today's briefing for the airline's half-yearly financial results, which saw Qantas turn in a bumper six months with a pre-tax profit of $976 million – a 15% boost over the same period last year – Joyce talked up the Boeing 797 as "a lighter aircraft than some of the widebody, twin-aisles that we have today." “It has a range that’s designed to fly transcontinental and maybe into South-East Asia so it’s not over-spec'd for the domestic operation." Qantas previously planned for the Boeing 787-9 to take on east-west routes, but now sees the Boeing 797 as a better fit. "Our thinking has evolved," Joyce told Australian Business Traveller on the sidelines of the airline's first Dreamliner delivery in Seattle. "While the 787 as with the A330 are pretty powerful, they are over-spec'd" for domestic flights, "so the economics do not work." However, with a larger passenger capacity than the airline's current Boeing 737 workhorses, there's also scope for it to take on the popular 'triangle routes' from Sydney to Melbourne and Brisbane. “We’re now at the cap of 80 movements an hour for four or five hours every day already" Joyce explains. "By 2026, when this aircraft is proposed to be produced, the airport will probably completely full by then. So the way to grow will be bigger and bigger gauge aircraft," with the added appeal of the Boeing 797 being able to do its 'turn-around' from inbound to outbound flights as fast as the Boeing 737. Boeing expects to offer its mid-sized jet in two versions, with a Boeing spokesman telling Australian Business Traveller that "one version would have more range capability and the other would be longer, adding more capacity." While not being drawn on the specific passenger breakdown of each model, the spokesman said the "family would seat 220-270 seats in dual class, or up to 300 in certain configurations." However, Boeing stresses that it's not rushing headlong to add what it calls the New Mid-market Airplane (NMA) to its catalogue. "The NMA is still a development effort. We’re following a deliberate, disciplined and driven process to close the NMA business case." And while Joyce is eager for Boeing to “get on and make a call”, he remains open to the competing Airbus A321neo, including a long-range version which is headed for low-cost sibling Jetstar. "The A321neo long-range aircraft is a very good aircraft as well. So we want a competitive dynamic to make a decision on what the medium- to a long-term replacement for the domestic Qantas fleet is and if Boeing decides to produce this aircraft, we’ll have alternatives and very competitive alternatives and that would be very exciting for us." I can see it replacing the 18 A332s and 787-10s replacing the A333s plus a few more of each for expansion to replace some 737s on the Sydney’s based trunk routes. By then though Jetstar will have moved to Sydney West to free up some Qantas slots. I have read in Australian Aviation, that Qantas has announced it has restructured its Airbus A320neo order to include 18 long-range A321neoLRs which will join the Jetstar fleet from mid-2020. The A321neolr's will be replacing the older A320's. I think Qantas are in a bit of a pickle. 797 would be great for Qantas and very popular with passengers. But 2026 is the problem. Thats if it is on time. Some A330's are 15 years old now. They need something in between. They can transfer jets with Jetstar like they did with A330's. A321neo would be good for Qantas until 797 then maybe transfer A321neo over to Jetstar. If Qantas want a fair few 797 makes sense to have 737MAX, 797, 787-9, 787-10, 777X. Comment on "Qantas CEO increasingly bullish on the Boeing 797"